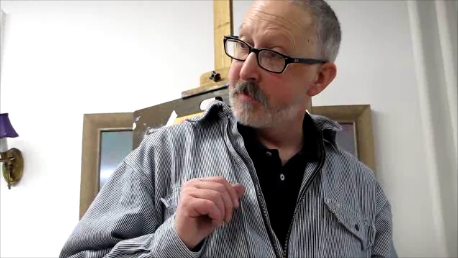 There is a video in production with segments of my workshop demo and lectures at Morristown, NJ. The editor is dragging his heels, but when it is "in the can" it promises to be a fine example of what and how I teach at my workshops. Please stay tuned! Denver area, May 19-20. Full. Cambridge, Canada, June 2,3. Space Limited. Contact Edward. Seattle area, Bainbridge Island at Bloedel Reserve (gardens). This is the premier spot in the NW for outdoor beauty. Did I mention that it is extra beautiful? August 4,5. Website for Winslow Art Center. Space Limited. All of my previous workshops have been filled, so do not delay if you want to participate in one of these scheduled workshops. My blog, Pastel, has been reflagged as Pastel Workshop, and now supports my workshops and has become a pastel instruction blog. My goals are to be concise and thorough in my topics. Currently, we are studying the Elements of Art and The Dynamics of Design. The blog is supported by short instructional videos. Special to readers of The Colorist: There has been a request for me to teach online, and I am working on a new blog format online workshop: Online Intensive Critique. 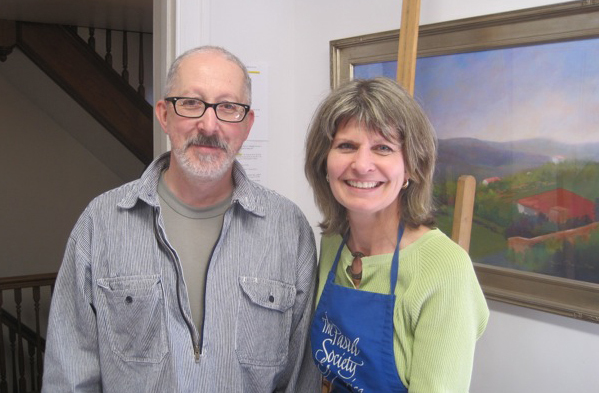 It will be a 3-week small group and one-on-one painting workshop. If you are interested, respond via e-mail or in my comments here. Schedule TBA. Linda Richichi is a real person who blogs. When Bloggers Meet, we have much fun. Linda and I. It was a great pleasure to meet artist and fellow blogger Linda Richichi in New Jersey. 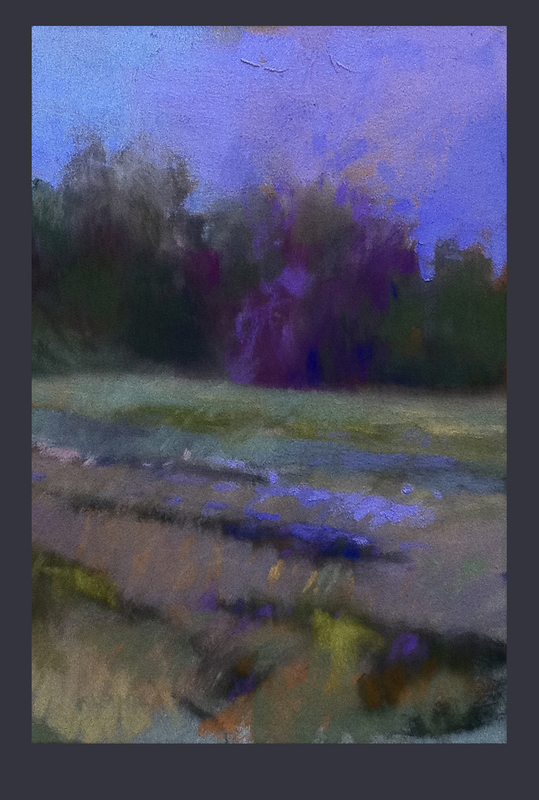 She inspired me with her well-developed color thumbnails, which are field sketches from her outdoor sessions. "...you displayed great passion, interest in your students and knowledge on the subject. I really enjoyed the experience. I know that you gave your all..."
Thanks, Linda! Your energy and attention was appreciated as well as all you added to the workshop. Linda Richichi - Feel The Energy! This piece I turned sideways, partially rubbed off, and then used as a demo in Morristown. I completed it in the studio. For some reason, I just felt like adding this video to this post today. This is a long video. I usually don't post anything longer than 4 minutes here. This one is about slow. About peace and tranquility. About the type of beauty you only get at a slow pace, and in places like this. The place shown is The Bloedel Reserve, which is accessed via Ferry from Seattle, and then a short drive across Bainbridge Island to the north end. You can take a workshop with me at Bloedel Reserve, on Bainbridge Island, Washington, August 4th & 5th., 2012. Contact: Winslow Art Center for information and sign-up. You get the feeling, after awhile, that these bloggers on the interwebs are more virtual than real. It helps to get out and meet a few to disabuse yourself of this wrong impression. It was a delight to meet a couple of artist bloggers at Julie Friedman's studio in New Jersey. 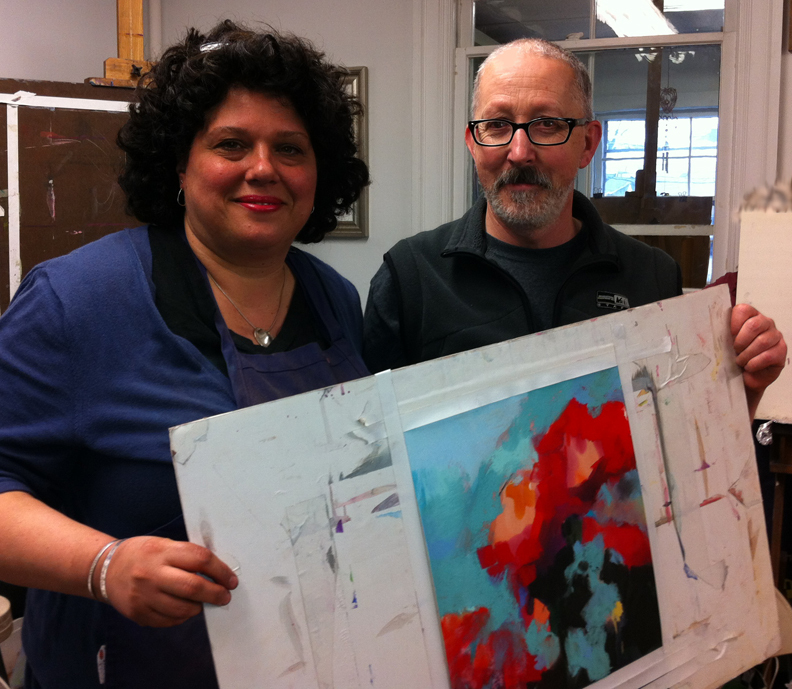 Here is the proof that I met Maryann Didriksen, who resolved a new pastel for us. Her review of the workshop is here: Shake It Up! Thanks for the hard work and for everything you added to our experience, Maryann. 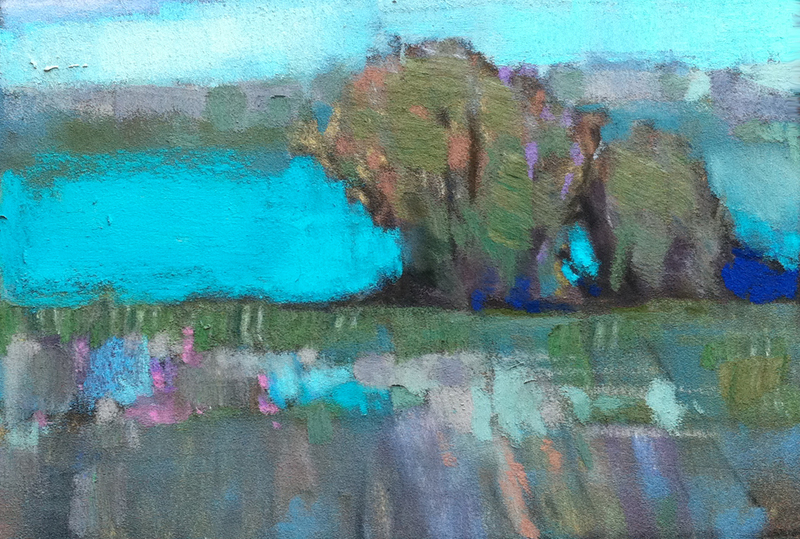 Maryann also bought a pastel from me while we were there, which shows that she has a lot of class! This is a special thanks to my readers for nominating the Colorist and Pastel Workshop for the recognition: 12 Art Blogs To Watch in 2012. The Colorist enjoyed this same appellation in 2010, and I am grateful for the kind thoughts that go into this. Happy Second Day of Spring, Everyone! Second Day of Spring, 2012! It was a fun winter, and I believe I rendered more snow scenes this year than is typical for me. Always look for the new. Saturday evening I was enjoying the sun, taking a beautiful drive in a top-down convertible and finding wonder in the Wolf Kahn views of the elm and ash forests in New Jersey. 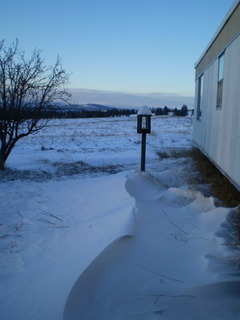 Today, I woke up to a ground blizzard! You will get a full report, and perhaps some video, of my workshops taught last week in Morristown as soon as possible. Thanks for staying tuned. When I am back home from New Jersey, I will complete the edit of this video. I will credit the camerawoman, and you can enjoy some my demonstration and process from my 2-Day workshops. Today, I will begin a second workshop and then be home late Monday. “Nothing strengthens authority so much as silence.” Leonardo da Vinci. “I am becoming freer. I think you can do miracles with what you have if you accept it.” Willem de Kooning. "The authority of those who teach is often an obstacle to those who want to learn." Marcus Tullius Cicero. “New faces have more authority than accustomed ones.” Euripides. 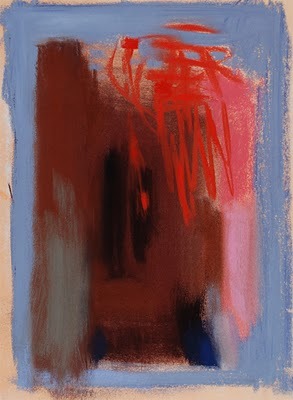 “I don’t want to be new anymore.” Willem de Kooning. “There is no such thing as art...There are only artists who are favoured with a gift of balancing shapes and colours until they get it right. And, rarer still, who possess the integrity of character which never rests content with half solutions, but is ready to forgo all easy effects, all superficial success for the toil and agony of sincere work.” E. H. Gombrich. “Being an intellectual creates a lot of questions and no answers.” Janis Joplin. “When I judge art, I take my painting and put it next to a God made object like a tree or flower. If it clashes, it is not art.” Cezanne. “Do it for the love of it. Fight over a prize so tawdry you'd throw out if it didn't have your name on it.” Gregory Sullivan. “Drawing is the honest of the art. There is no possibilty of cheating. It is either good or bad.” Salvatore Dali. “I learn as much from painters about how to write as from writers.” Ernest Hemingway. “Anyone who conducts an argument by appealing to authority is not using his intelligence; he is just using his memory.” Leonardo da Vinci. “The great artist is the simplifier.” Vincent Van Gogh. This garage drawing will be a book cover in the not-too-distant future. Oh Canada! 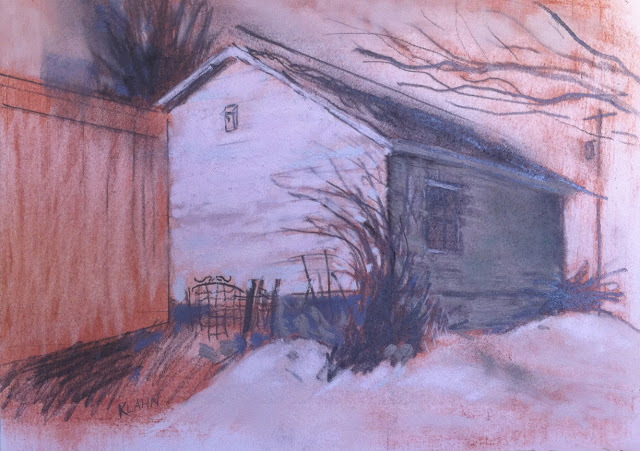 Come June 2nd and 3rd, I will be bringing my workshop to Cambridge, Ontario at the Pastel Studio store. 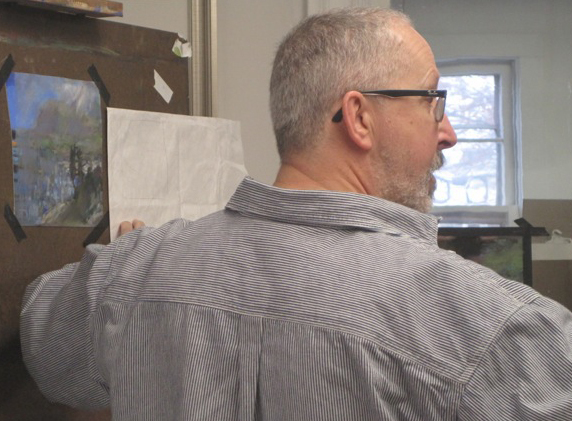 The Pastel Studio of Canada is a tremendous place to resource everything from Roche and Diane Townsend pastels to Wallis and Colourfix surfaces. Contact or phone here. Two days, $250 Canadian. 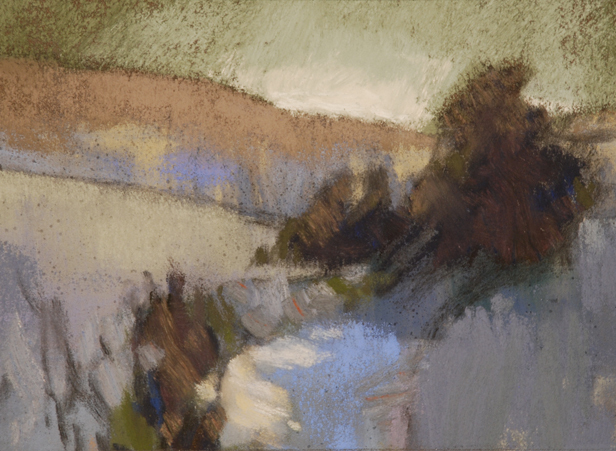 Ken Elliot is teaching a one day workshop in Parker, CO. Painting strategies, and succeeding as an artist. This will be a rewarding Denver area workshop from a colorist artist! My Denver Area Workshop: One more space! Studio. Do you use a projector in your studio? I have had these old school opaque, and reflecting projectors in the past. This year, I have stepped up to a digital LED projector, and also an LED flat light pad. The high tech. light pad was a help for me in transferring the garage image from its original, plein air drawing to what would be a finished mixed media piece. This one took about a year to resolve. Read our friend Astrid Volquardsen's article on Caran d’Ache pastel pencil manufacturing at her blog. Very eye opening and much fun. 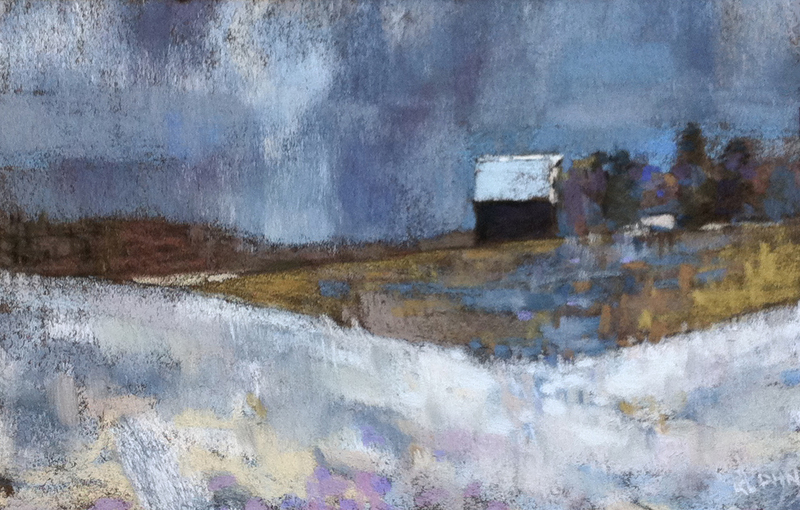 When I paint the view out my studio window, do I get credit for that as a plein air piece? Just kidding. The Denver Workshop, May 19th & 20th, has one more space available at this time. Many thanks to Ken Elliot, who is now blogging, for his encouragement and help putting this one together! 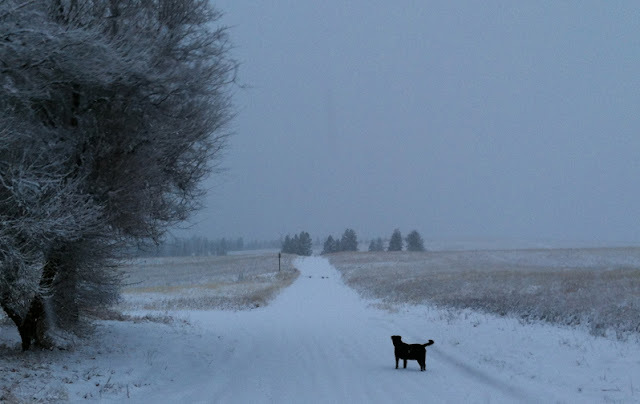 Also, my Portland friend and artist, Sarah Peroutka, is blogging. 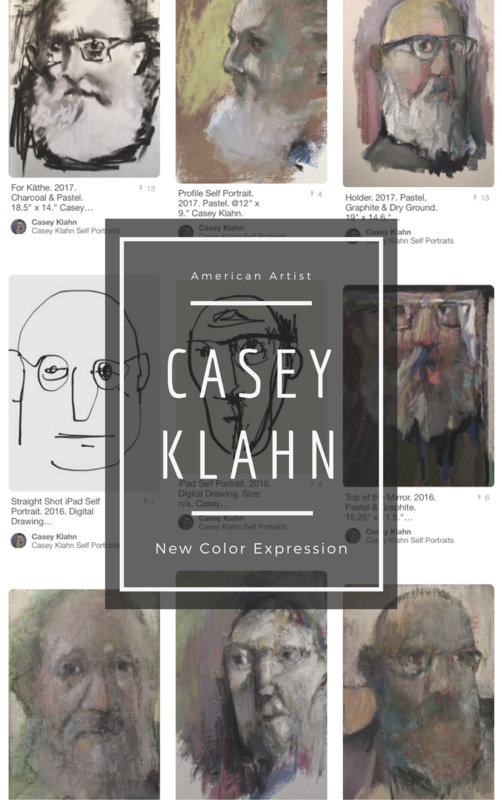 Blogger Sam says that dog's see a different color than you and I.
I found an old full-sheet abstract work in the bottom of a flat file drawer, and I am enthused about it! I started playing around with the photo of it on Photoshop, and then decided that cutting it up into pieces would provide better stability within each individual part. It is a decent pastel as is, but can be more fun broken apart and readdressed. Will I add more marks, or leave each piece as is? Another possibility might be to run a single print, and then see what the pieces might yield. 3-D models of color are designed around three axes: hue, value and intensity. The three properties of color are well known by the artist: hue, value and intensity. But, how much attention do we pay to intensity? 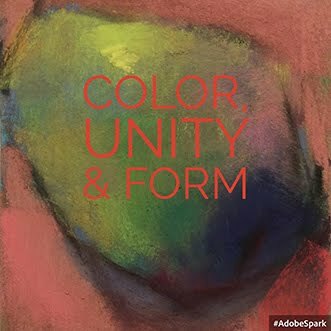 It is a critical element of contemporary color, given the broad availability of colors now. You may not wish to "push" high intensity colors in your artwork, but ignorance of this key property is also a disadvantage to you. Above, my pastel, The Turquoise Axis, is focused on color intensity as a subject. Below, see the Renaissance piece by Deiric Bouts, which utilizes intensity to illustrate sacred meanings. 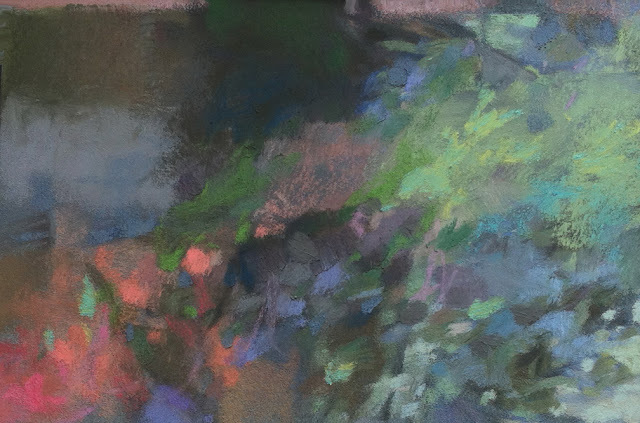 I have relied on the Getty Museum page on Understanding Formal Analysis for much of the research for the Elements of Art series at my blog, Pastel Workshop. This entry on color intensity, provides a timeless illustration of the forgotten property of color: intensity. Intensity describes the purity or strength of a color. Bright colors are undiluted and are often associated with positive energy and heightened emotions. Dull colors have been diluted by mixing with other colors and create a sedate or serious mood. 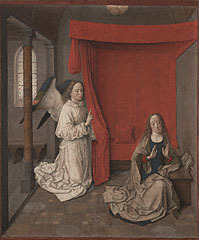 In this image the artist captured both the seriousness and the joy of the scene with the dull gray stone interior and the bright red drapery. 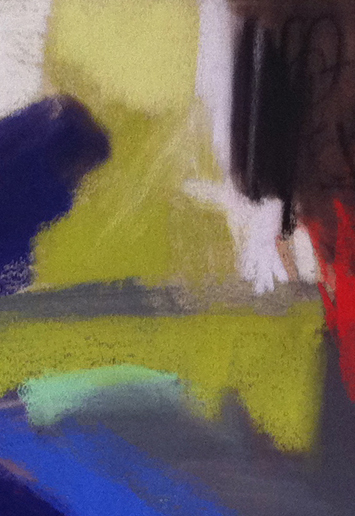 One reason pastels are called "sticks of dynamite" is that they can bring incredibly high intensity to your work. Like paint from the tube, there is no adulteration of hue. The trick is handling that explosive with intention and craft. Does your color composition speak clearly, or is the intensity blowing up your work? 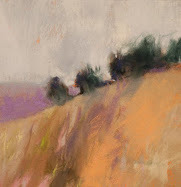 Follow my series, Elements of Art, at pastelsblog.blogspot.com, Pastel Workshop.